Venezuela's foreign minister said he was illegally detained for 90 minutes by officials at a New York airport and accused them of treating him abusively by trying to frisk and handcuff him. U.S. officials called Saturday's incident regrettable and said they had apologized to Foreign Minister Nicolas Maduro. Maduro called that insufficient and said Venezuela would seek a legal challenge through the U.N. to what he called a "flagrant violation of international law" and his diplomatic immunity. "We were detained for an hour and a half, threatened by police with being beaten," Maduro told reporters at Venezuela's mission to the U.N. "We hold the U.S. government responsible." A U.N. diplomat, who spoke on condition of anonymity because he was not authorized to speak publicly, said Maduro's trip was delayed because he had showed up late without a ticket, prompting extra screening. Department of Homeland Security spokesman Russ Knocke denied that Maduro was mistreated at John F. Kennedy International Airport when he was selected for an added security check. "He began to articulate his frustration with secondary screening right after he went through," a metal detector, Knocke said. "Port Authority officials confronted him when the situation became a ruckus." Maduro said when one official ordered him to go to another room for a strip-search, he refused. He told CNN en Espanol that the official pushed him and yelled at him. He told reporters the situation only worsened when he explained he was the Venezuelan foreign minister and showed his diplomatic passport. Maduro said authorities at one point ordered him and other officials to spread their arms and legs and be frisked, but he said they forcefully refused. He said officers also threatened to handcuff him. "We responded with the dignity of Venezuelan revolutionaries ... with strength," Maduro told reporters at Venezuela's mission to the U.N. "It's a Nazi government, a racist government." If this is how U.S. authorities treat a foreign minister, he said, "what won't they do to Arab people for wearing a turban?" He said his passport and ticket were seized and eventually returned, but the incident prevented him from flying home Saturday. U.S. State Department spokesman Tom Casey said it was a "regrettable incident" for which "the U.S. government has apologized." The two countries' relations — strained for several years — took a particularly confrontational turn this week, when Venezuelan President Hugo Chavez, speaking at the annual U.N. General Assembly, called President Bush "the devil." U.S. officials often call Chavez a threat to democracy. Maduro told reporters that the treatment of him and other Venezuelan officials seemed in part to be an "attempt to provoke us." He said about an hour and 20 minutes into his detention, he received a call from U.S. Assistant Secretary of State Thomas Shannon, who apologized and said State Department officials were on their way to resolve the matter. Five minutes later, State Department officials arrived and ordered Maduro and the others to spread their arms and legs to be frisked by police, he said. Maduro said Venezuela has lodged a protest with U.N. Secretary-General Kofi Annan, and that the incident should be investigated so that those responsible are punished. He said those who detained him did not make any particular accusations. Earlier Saturday, Chavez said on Venezuelan television that U.S. officials had detained Maduro after linking him to a failed coup that Chavez led in 1992. 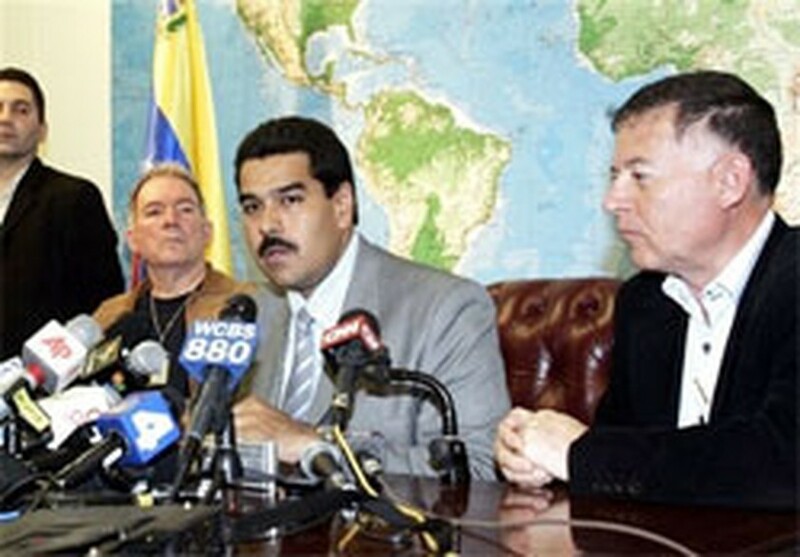 "They have held him accusing him of participating in terrorist acts," Chavez said in Venezuela. "He didn't even participate in that patriotic rebellion." Chavez also said Bush may be seeking to kill him for calling him "the devil" at the U.N.
Venezuela is among the top five suppliers of crude to the U.S., but relations soured in 2002 after the Bush administration swiftly recognized leaders who briefly ousted Chavez in a coup.